Commercial Outdoor Bench Seating | id created, Inc. It goes without saying that site furnishings can have a significant impact on public spaces. Bench seating has long been the best choice for community spaces where social interaction between people and their environment is the goal. Seating has come a long way from the standard bench. 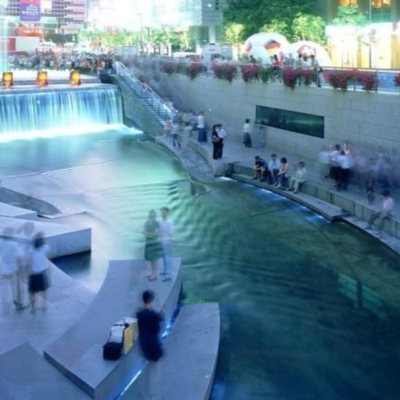 Designers and landscape architects today have the opportunity to create vibrant, connected spaces in their communities. As leaders in the architectural design space, Metalco continues to set the standard in creating innovative, commercial bench designs. Get inspired by these examples of stunning community benches that empower designers to create beautiful places. Simplistic seating designs are an ideal opportunity to showcase contrasting but complementary materials. 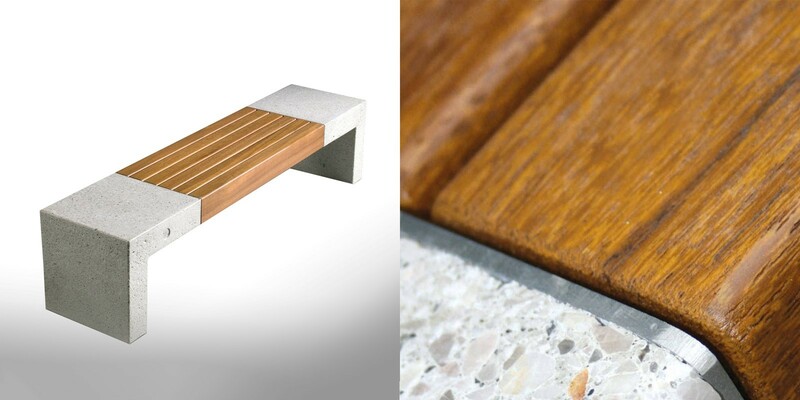 This Giada bench combines Pietre Di Marmo, a mixture of concrete and marble, with hardwood seats. Unexpected site furniture designs leave a lasting impression. The tubular steel bench isn't uncommon, but the Libre Evolution collection puts a literal twist on a classic design. Completely modular, the Libre Evolution collection consists of torsion and straight benches that can be paired together. It can function as a multi-directional seating design or a standalone bench. 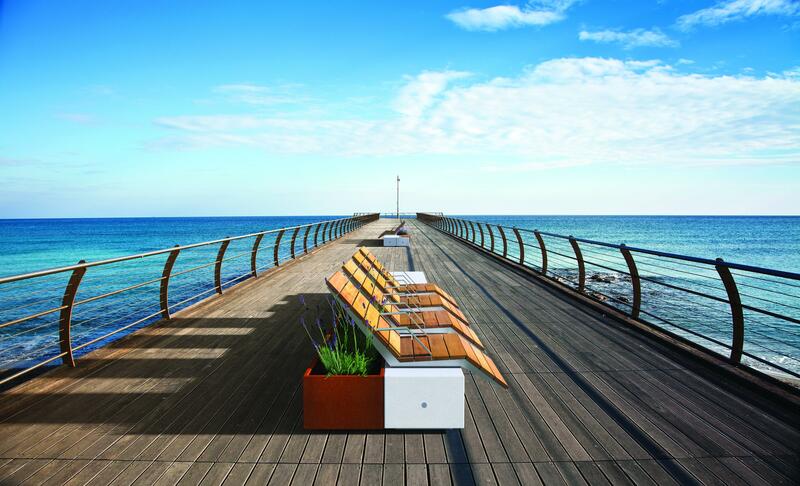 The right bench can elevate the feel of any place. 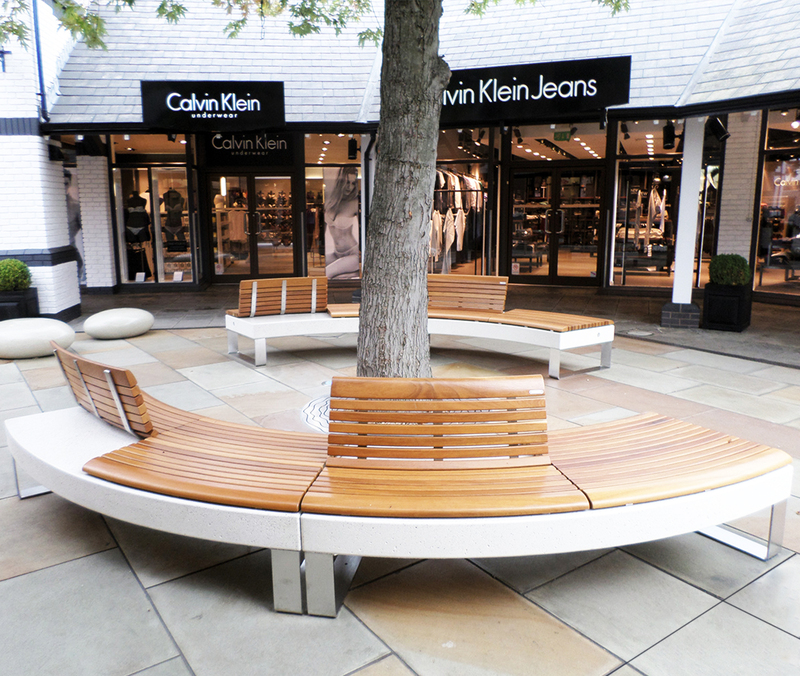 This 45 degree curved Diamante bench series is situated around a standalone heritage tree in a popular outdoor designer outlet. Instantly inviting with its alternating hardwood seats and backs, this bench provides visitors the versatility to sit, place their bags and people watch as they please. 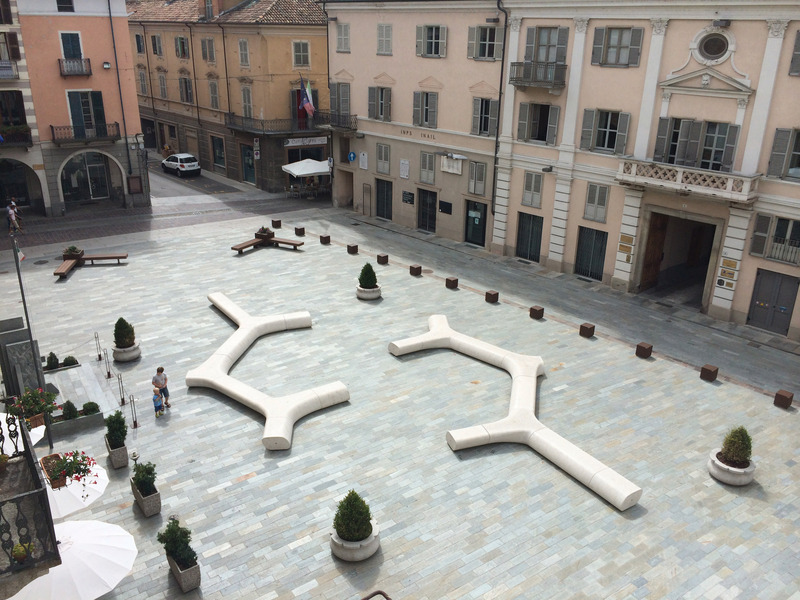 The Twin bench encourages passersby to take a seat and enjoy the company of their community. 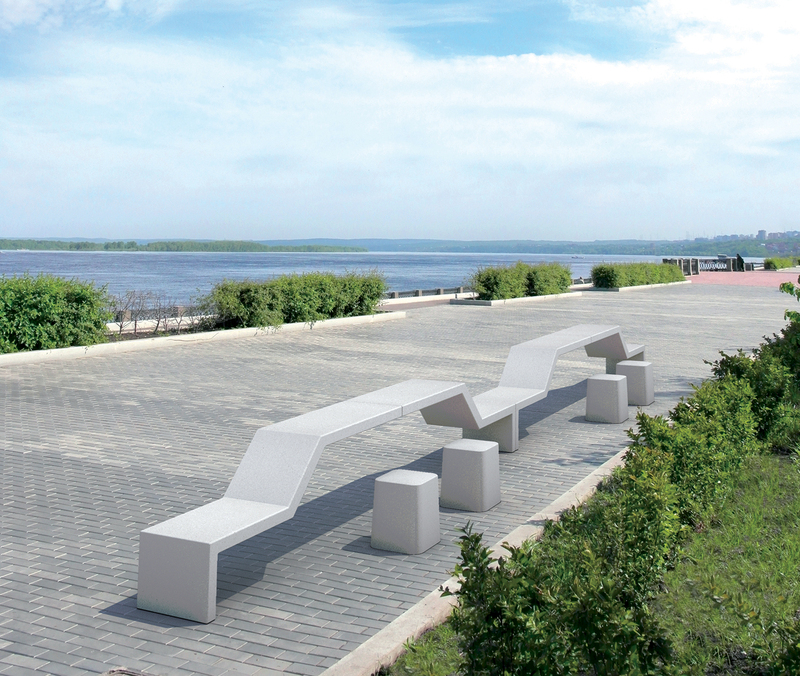 This bench, made from High Performance Concrete, is a durable alternative to standard concrete. Cantilever extensions function as tables for games, meals together or an outdoor work space. The unique design of this bench makes it accessible to people of all abilities. Organic shaped seating contributes to a simplistic and natural space. These organic shapes seamlessly blend the courtyard with its surrounding environment. Designed for Metalco by brothers Pio and Tito Toso, the Tree Line bench is modular and offers a multitude of seating configurations. Endless custom options can include built-in planters, or sections can be positioned to flow with standalone planters, making for a truly modular design. Color can alter mood and perception. It allows us to attract attention to a particular area, make a space feel larger or smaller, tie different areas together or provoke a feeling. 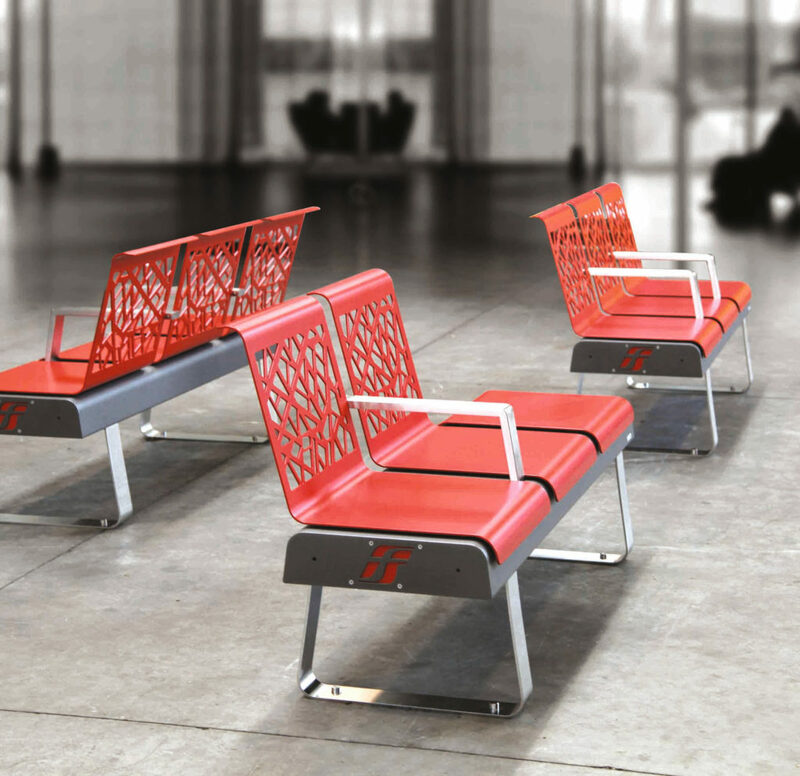 These brightly colored Freccia benches add a pop of vibrancy to a busy airport terminal. Alternatively, when coated in a Corten Color™, which has a more natural tone, they can inspire a feeling of calm and serenity. No matter the color choice, this airy design is a fantastic complement to any place. Backless benches are a great solution when visitors are able to enter a place from several directions. 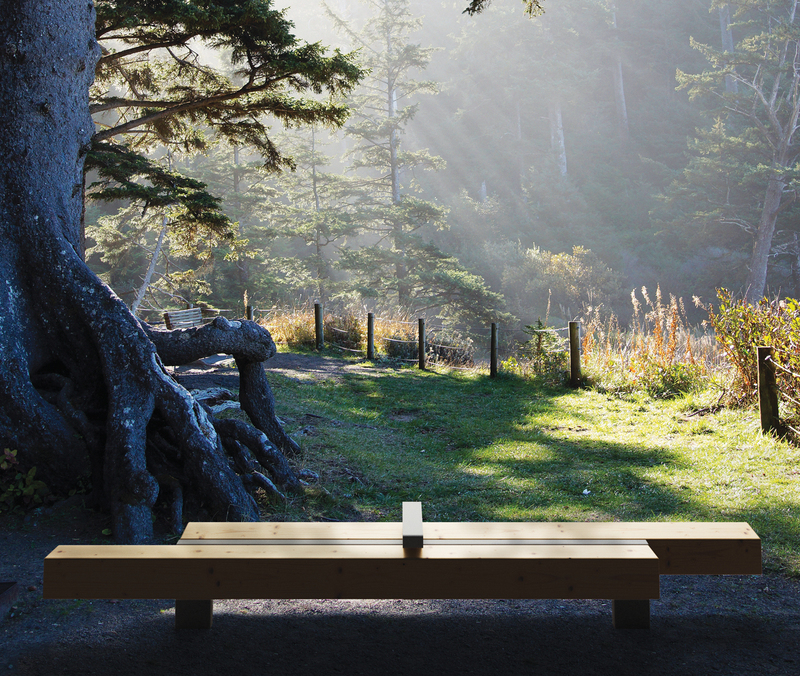 The Big Harris is a beautiful, linear wood bench with steel supports that gives a feeling of simplistic elegance to the surrounding area. 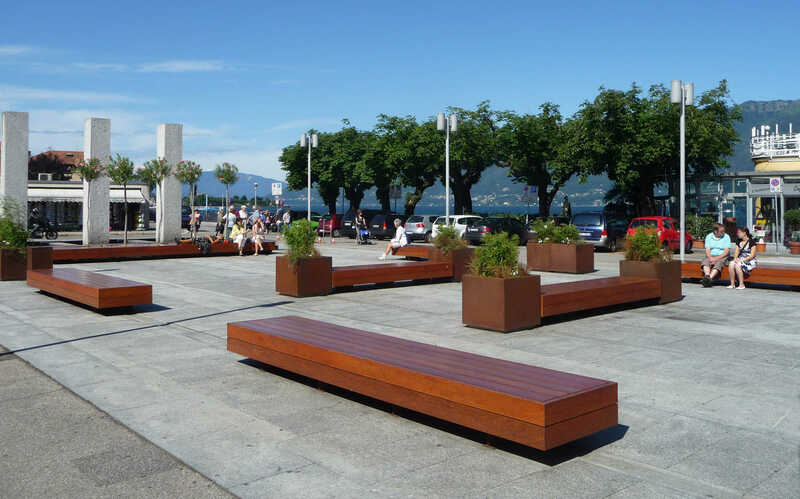 Combined with corten steel Dahlia planters, Big Harris benches create natural islands of relaxation for communities to share. Alterego is another example of how well wood, concrete and steel work together. 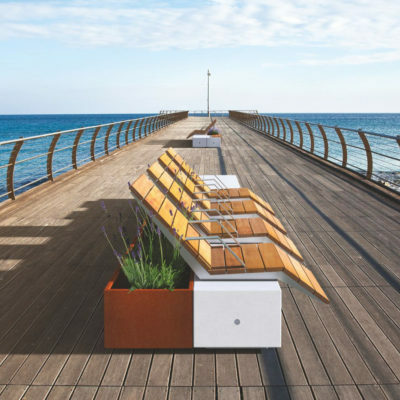 This socially designed modular seating system features multiple components, including seating, planters, tables and arbors. The components can be customized to fit any design. One of the most inspiring ways to create a meaningful outdoor place is by incorporating art into the design. LPA Inc. included whimsical fun in their design by adding this Moonstone element to Mission Towers II, a prestigious, class A office building in Santa Clara, California. Made of marble and concrete, the Moonstone is an iconic contribution to the outdoor community area. This design invites people to gather, giving them the opportunity to mingle with art in an everyday setting. 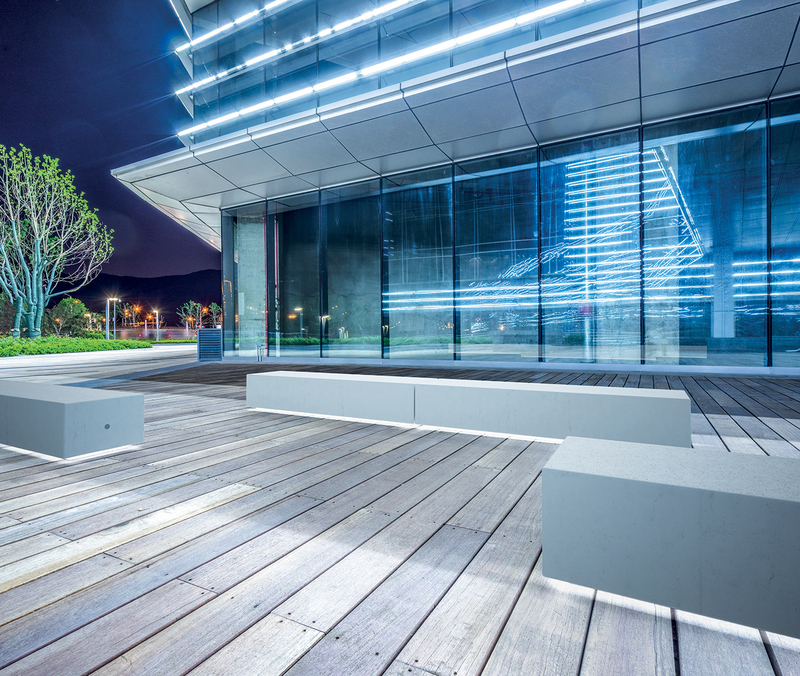 Underseat lighting provides a rich depth and ambience to these modern, cast benches. The iBox's monolithic shape appears as if it were carved from a single slab of stone, and its minimal design showcases how clean lines and low-profiles can be a statement piece. Nature trails and bike paths aren’t meant to be blazed through, but rather, are made to be savored and enjoyed. Providing seating in these natural surroundings allows a place for people to connect with nature and take rest when needed. 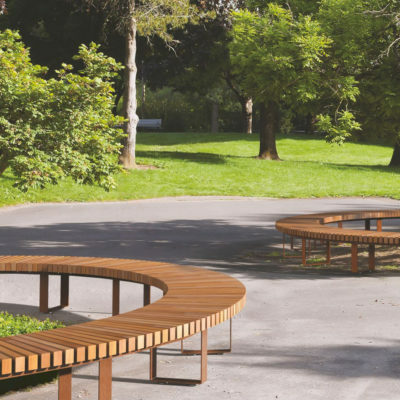 The Foresta bench is available in a staggered design as shown or, alternatively, an in-line design which doubles as a bicycle rack, providing a place for riders to rest and enjoy the scenery around them, while keeping their bike nearby and nature undisturbed. Made of FSC-certified Larch wood, this design is a sustainable option for designers. With over 3,000 products to choose from, id created, Inc. gives the architectural and design community endless options to create places that leave a lasting impression and encourage meaningful interactions within the communities they serve. Find inspiration and solutions to complete your vision at idcreated.com.